Since opening in 2005, Red Duck has kept up a steady stream (or should that be torrent) of releases. If the opening of 2018 is anything to go by, that trend looks to continue with the brewery releasing four beers in cans at the same time and promising four more tinnies each season. They show off a new look Red Duck too, with the brewery’s eponymous logo taking a less prominent spot and the duck walking towards each beer’s title. Tucked on the upper corner of the label are three words the brewery hopes help showcase its story: small, independent, good. 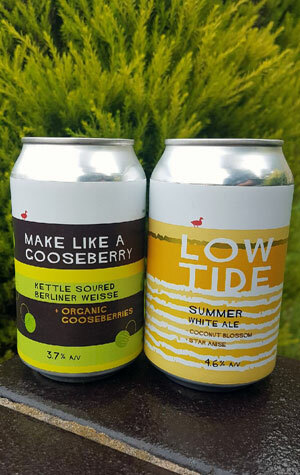 First among the new beers is Make Like A Gooseberry Berliner weisse. It’s a kettle sour loaded up with bramble-harvested organic gooseberries, which presents with a tart, grape like aroma, slight spicines and some yeast derived pepper. The hazy, light straw-coloured beer with a sprightly carbonation is a case of sweet meets sour, in which soft citrus gives way to green apples. The Low Tide Summer White Ale is just as much of a summer quaffer, one that packs a fruit-heavy punch on the nose, upfront bubblegum and then citrus and orange. Flavour wise, you'll pick up those citrusy characters, with the addition of coconut blossom and star anise adding a distinct herbal, slightly medicinal touch, and the picture completed by floral hops and a peppery finish.